Mary Roach is a fairly prolific author who brings humor and common sense to popular science. 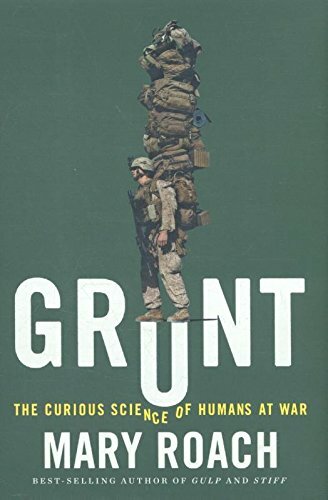 In this varied and interesting work, she explores the science of keeping human beings intact, awake, sane, and uninfected in the bizarre and extreme circumstances of war. The subject area itself is fascinating. Roach looks beyond the preoccupation with studies of violence into seemingly bland topics with color and memorable anecdotes. Military uniforms are tested to the max through multiple washing and the ketchup stain test, while the reader learns about the critical difference between Kevlar and Nomex and why snipers hate zips. It is certainly accessible science, but some readers may crave more detail and focus as the narrative is somewhat clunky. Grunt moves from uniform design to the evolution of how U.S. military vehicles have adjusted in response to the IED threat born of the war on terror—including the use of donated bodies to test them on—to the impact and damage to hearing caused by war. Once you know how much work has gone into the simple foam ear plug you’ll never look at it the same knowing that in the U.S. $1 billion a year is spent on disability payments for hearing loss and tinnitus. Particularly harrowing are the stories of how bombs leave their impact on soldiers and the pioneering field of genital reconstruction. Who knew that it is possible to create a urethra from hairless skin on the underside of the forearm! Roach manages this while also including the fact that the surgeon conducting the procedure sounds like James Spader. The book is a treasure trove of unorthodox thinking and experimentation when faced with the challenge of war. Whether it is how to tackle heatstroke, potentially lethal diarrhea, escaping a submarine, or avoiding being eaten by sharks, Roach gives a memorable starting point into the topic that leaves readers wanting more.